CUNA council confab speakers cite survey results that show only 31% are ready. 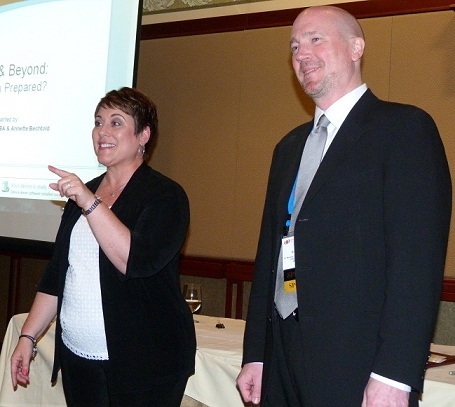 Annette Bechtold, Digital Benefit Advisors, and Brad Pricer, CUNA Mutual Group, outline critical health care reform compliance dates within the Affordable Care Act with attendees at the CUNA HR/TD Council Conference Tuesday. Only 31% of credit unions are ready to comply with the 2013 and 2014 requirements of the Patient Protection and Affordable Care Act of 2010, according to a survey by CUNA Mutual Group.